Rebbe Nachman of Breslov taught that a person attains real bitachon through silence. In your experience have you found that bitachon and silence are tied together? This is a bit of personal Providence - we call that hashgacha pratis. Allow me to digress a little before addressing the question directly. In the spirit of public confessions that was so in vogue in the 1990's, I would like to join the ranks and share with the Internet public one of my bad middos - verbal diarrhea. It got so bad that the Stretner Rebbe told me with a gentle chuckle to go and join a monastery. Actually, a friend of mine wanted me to join him for a ten day silent retreat in the Negev with the Vipassana Buddhists - seeking to elevate spirituality through silence. After an enlightening conversation with one of their Israeli spiritual guides, it seemed that I would not be able to take part if I wore tefillin or offered our traditional prayers, even silently by heart. In the brief conversation, he refused to consider a special program for observant Jews on the claim that Vipassana only works if you completely let go of all former practices or habits. Kosher food would not have been a problem. I had a vision of a daily ration of kosher vegetarian gruel and a daily video lecture from the Guru attended by a devout, orange clad congregation in lotus position on the Negev sands. Then the crowd turns to me under a lone juniper tree, wearing my tefillin, and Fellini -like, chases me through the desert in angry faced silence. "Perhaps it isn't for me," I thought. The next Shabbos, at the Tzemach Tzedek shul of the Old City, I discussed this with Rav Adin Even Yisrael about my interest in Vipassana. He put his heart into discouraging me from this, as he often does, and after that his Chabad expert on India made the claim that Vipassana is unequivically idolatrous for Jews. Whether that is accurate or not I cannot say, not having investigated their methods and beliefs any further. As the Buddhist saying goes, if you meet the Buddah on the way, kill him. I ask naively, if as a Buddhist, you are supposed to kill your saint, or perhaps even the incarnation of your god, then except for burning incense to graven images or actually be living in or invoking their power, it can't be that idolatrous, now, can it? But I digress. The expert on India, head of the Israeli Chabad 'Shiviti" organization for Israelis who woke up to the reality that there is a world beyond the physical while travelling in the east, made a wise suggestion. "Why don't you do a forty day silent retreat at the Kotel?" Bear in mind, a normal talker might get in nine or ten thousand words in a day. As a teacher and a davener,I might get in about twice that much. The last time I went for eight waking hours without speaking was in 1989 after I walked around the remains of the Maidanek death camp in Poland. I went back to Boston, and heard Professor Wiesel saying, "We must not accept amnesia in others, aphasia in ourselves." Not all silences are the same, it is just a sense of the right thing at the right time. Silence allows us to better trust in God. The first thing that comes to mind is the response I first learned about from a rabbi associate of Professor Wiesel's who led that very trip to Poland. In a room there in the "museum" or remains of the death camp, the rabbi said, "I am reminded of how Aharon HaKohen lost two beautiful sons, Nadav and Avinu, who offered a fire that God did not command in the Mishkan, and how they were burned by God. What was Aharon's response? Vayidom Aharon. - and Aharon was silent." This is the silence of suffering and acceptence, a kind of ultimate expression of trust and faith. When we face a relationship with God that we just cannot comprehend, namely how the Source of all good can bring us suffering, then there really is no answer. There is no explanation, no neat theory, no words that can really console. One day in Heaven, Moshe Rabbeinu saw how Rabbi Akiva, the greatest holy scholar not just of his generation, but surely many generations, God's own special treasure, was tortured and killed by the Romans. Moshe asks God, "This is the Torah and this is the reward?" Meaning, this is how you reward the greatest scholar of the Torah. God's answer? "Be silent. This is how it came up in my mind." A wise man once said, "The single source of man's unhappiness is his inability to sit in his own home and remain quiet." If the world is not the way you want it, you have two options. On is to speak out, do things, do what you can to influence your world. You will either succeed or fail, and sometimes you need to wait for a long time to even know of the outcome. The other option is to remain silent, accept the situation, and again, wait and see how it turns out. Sometimes our misinformed efforts make things worse, and sometimes after the poise and patience of our trusting silence we are pleased to see how God takes care of us effortlessly. You don't need Vipassana, you don't even need the Kotel, all you need is the ability to stop and listen to the world around you and you will see a whole world both internal and external, that until then you were deaf to because of your own noise. In your quiet observation, if you reflect on how God is trying to guide you to your individual tikkun through the people and situations,even, or rather, especially, those that disturb you, then you will have used silence as a vehicle to trust in the One "Adon col ha'maasim," the Master of all actions. Rebbe Nachman writes that silence is a good way to develop trust in God in his Sefer HaMiddos (Bitachon #14). On a psychological level, a person is insecure, uncomfortable with himself, will have to constantly assert himself. He is making up for feeling inadequate. My own self-esteem, at least in shul, has increased even since I took it upon myself a month ago to only say what is truly necessary. I sit quietly by the Rebbe, and listen to the conversation of the chevre. Some share true wisdom, some are foolish, but it makes no difference. I am now confident enough that I don't have to challenge the the wise ones or taunt the fools. I just listen. And if I am asked to speak and I have something to say, I speak. After all, the Mishna in Pirke Avos 5:7 says that a true chacham (wise man) does not speak in front of someone greater than him (unless he is asked to), and does not interrupt his friend when he is speaking. Be silent, and learn. Be silent, and wait until your friend or guest has finished speaking before you respond. Failure to do so is more often than not a sign of arrogance or foolishness. One of our beloved tszaddikim once said that there is indeed a level greater than the brave and faithful silence of Aharon in the face of personal tragedy. "In order that we sing sing of Your glory and not be silent." (Psalm 30) . I think Reb Dovid Sears also discussed this issue. While it is indeed unfortunate that the Vipassana retreat was not for you, I think the deeper issue is what was referred to in a post this week; meditation. Judaism seems to have uneasy relationship w/ silence. On the one hand Dovid HaMelech states: "To You silence is praise" and on the the other we daven and learn and say (yes say) Brachot. Meditation in silence where ones internal chatter is let to float away like a cloud and the silence, perhaps the praise of G-d, can be allowed into our beings..Are there words for that? Does such a silence also constitute Avodah Hashem? I feel it does and dafka it has helped me in the verbal' parts of Judaism, davening, learning, brachot, etc. That does not mean that in ones silence one avoids powerful emotions such as anger, hatred etc. that also need to be dealt w/ us to be menschleikeit in the world. That too is a benefit of siting in silent meditation,we get in touch w/ our emotions and are not contrilled by them. What does it mean to us when we read that Rambam (Mishne Torah) and others who talked about our sages who sat in silence for an hour (!) before (and after) they prayed. There are many uneasy explanations in my opinion but it all seems to come back to the issue of silence and how it opens us up to a relationship w/ Hashem. Yes it is not easy and not everyones cup of tea but for those who have experienced it, a very powerful tool. Here in the states some Jews have have organized retreats and sittings w/out the vipassana or zen or buddhist baggage. Silence davening, learning and silence learning davening. Deeper and deeper into silence then back to our daily lives. What a beautiful gift Hashem has given us that we can use silence as praise. How did we receive the ten Commandments in this weeks Parsha? Actually received it at that moment (and every moment really)? Was there silence? I would like to know how I can get in direct contact with Rabbi Edwards to ask him some questions. Thank you. E-mail me, Shoshana and I will put you in contact with him. I heard a shiur recently with R. Tatz called Silence. He wove a long thread and finished with the idea that silence is a trait of modesty. I thought that was very beautiful. Thanks for the post it was very timely and relevant. I actually woke up this morning thinking about that shiur and then read your post. Shabbat Shalom. Silent yichudim are a higher level of avodah than learning Torah (Hakdamah LeYichudim to Achdus HaOlamos p. 45, R. Eliyahu Ovadiah) and they transcend verbal prayer as well (Leshem Sh'vo VeAchlamah, Sefer HaDe'ah, Chelek Beis, Drush Heh, Anaf Gimel, Siman Zayin). ASJ - what is your email? Jonathan, you have your sources down, but still, I am asking myself, "Why should silent thought be any higher - meaning more praisworthy or better -than words or actions?" The point is to unify thought, speech and action, do do things mindfully. Acting and speaking mindfully and purpousfully is the real Yichud. This is a basic teaching of the Baal Shem Tov. Acording to the Midrash, Chanoch was a shoemaker and would unite the Kadosh Baruch Hu and the Shechina with each and every stich. The Kadosh, Baruch Hu is the world of thought, and the Shechina is the world of action. When we do what King Shlomo told us, "everything that you are able to do, do it(joined together) with the power of your mind." So uniting the Kadosh baruch Hu (thought) and the Shechina (action) is simply done by thinking before you speak or act. However, you mentioned "killing your saint" or 'an incarnation of your god," but the Buddha was very clear that he was neither a saint nor a god. After his enlightenment, when he looked radiant and was asked what he was -- a saint, a god, his response was, "I am awake." The reason I am mentioning this on ASJ is not to bring in anything foreign or inappropriate but because there is often some confusion about this topic. The idea behind Buddhist meditation is not to leave the world but to enter that silence and then return to the world and function in it coming from that place. We could say it is something like "running and returning," with the residue that we bring back with us from that silence. I also agree with your comments about mindfulness uniting the world of thought and the world of action. Please continue with posts and discussions such as these -- they remind me that there is such beauty in the path of inner Torah. Betzalel Philip Edwards: Yichudim on lower levels are harder to perform (as stated in sifrey Chasidus). But Baal Shem Tov speaks about yichudim in thought and in speech both (in actions too BTW). Rabbi Gutman Locks, while immersed in Hinduism before he returned to Judaism, actually did not speak for several years! See his enthralling autobiography, Coming Down to Earth. His book on meditation, Taming the Raging mind, has a lot of material on what you could call silent meditation. See especially the distinction between active and passive meditation. As Rabbi Sears noted, Rebbe Nachman's work doesn't seem to have a lot of references to silence, except for the few passsages on bitul, but Rabbi Ozer Bergman has expanded this into a chapter of his book on hitbodedut. I'm not sure, but I think Chabad meditation traditions may have more of this, which may explain the different approach of Rabbi Locks. A certain amount of silent meditation each day, whether passive or active, is good, I think, at "calming the raging mind," or making us overall less calm and reactive, and happier. That's one reason so many people have become so enthusiastic about meditation in the last few decades. Rather than just meditation on nothing -- just a sensory experience like your breath -- doing a silent meditation focused on feeling love for Hashem, or feeling thankful, or trusting Hashem and fearing nothing in the world besides Hashem, can be even more powerful. Presumably the sages who meditated an hour before and after prayer did so with devekut. Even if the Rambam's writing on this is not the accepted halachah on how we're supposed to daven, we should take it as a sign that we should take meditation very seriously and spend time doing it every day. If even Rambam, the most rationalist and least mystical of all the sages, told us to meditate two hours a day, then there must be something to it! There are statues of the Buddah that are worshiped, food is offered to them, incense is burned to them - "buddha of infinite light, buddha of peace," love buddy, chuckle buddy, beatific buddy boy, what a bubbaleh! And even if you prove that neither Buddah or Jesus called themselves Gods, it is nonethless irefutable that simple people have turned them into idols and in doing so removed themselves from the catagory of b'nei Noach. Buddhism or Christianty are not my fields. As a student of the Torah, I know that we cannot accept meditation as an end in itself, it is merely a means to connect to the One and only and perhaps draw down mochin d'gadlut. We may only meditate in order to experience bliss and serenity if such an experience enhances our love and fear of God , or enriches our service of God and man. The point of Kabbalistic meditation, "Kavanot" (Theurgy) is not to get high ("Hitaloot ha'Nefesh.") The point is to appreciate the awesome heights and lights of Godliness and use such enrichment in the service of the Torah, again, serving both God and man. So, as Jews, if we have such an ancient tradition that basically agrees with the side of Budhism, which is, as you well presented it, to, "enter the silence, and return to the world, functioning from its place," then why would a Jew need buddhism? As Jews, we already have its positive energies in our own back yard. I agree w. you, ("anonymous") If ASJ wants I have some translations from the Rebbe of the Warsaw Ghetto, the Piasesner, about Jewish meditation ("Machsahva Chazaka" literaly "strong thought") that I would be happy to post. And as an aside - lets leave the honorific titles like Doctor or Rabbi to those who have passed the relevant tests. Not that passing Rabbinical tests from a real beit din makes them in any way a better person, obviously. Getting smicha in Israel is, in Rav Sheteinsaltz's words, "the equivalent of graduating from sixth grade." I like to use the title "Reb" for a God fearing Jew who has not actaully become a Rabbi. Bahaltener , I don't understand what you mean, "yichudim on lower levels are harder," could you make this more clear? thought I also entertain reasonable statements even when they are not sourced in Jewish writings. 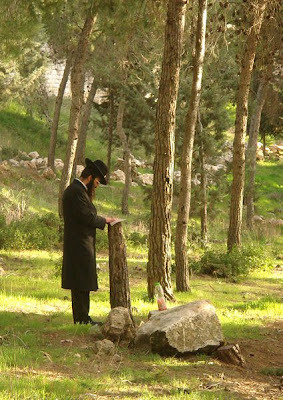 Just one small point for Yishai: I didn't mean to say that Rebbe Nachman rarely discusses silence -- just that his derekh of hisbodedus emphasizes speech as a way of exploring and expressing one's inner being and "connecting" to God experientially. The "trick" is to experience the oneness in the manyness of the world we commonly experience,the silence in the cacaphony and dissonance, the sea in each drop. Or to use the Berdichover Rov's metaphor, to read both the letters and the space around the letters at once. Great article on silence - very Twerskyesque! rabbi edwards; could you please put up the maamarim of the piaszetsna on jewish medidation? One of the most helpful instructions I have ever had, and do my best to live by, is that one should only say that which is, at the same time, true, helpful, and kind. Otherwise, one is to remain silent.